So over the last couple of days I have been using and tweaking the UI of my Chromebook’s Linux partition. A couple of things about the Linux version that I am using that I didn’t know before. It seems as though the linux side of the laptop is sharing the home directory of the ChromeOS side of the laptop. When you download things on either ChromeOS or XFCE Linux they both end up in the same downloads folder. Strange?? It actually turns out to be very handy when you need something on both OS’s. Background’s for instance. I also added a GUI tool known as Conky. Download Here! Screen Shot below. It is a handy little tool that shows you some useful information about your system. 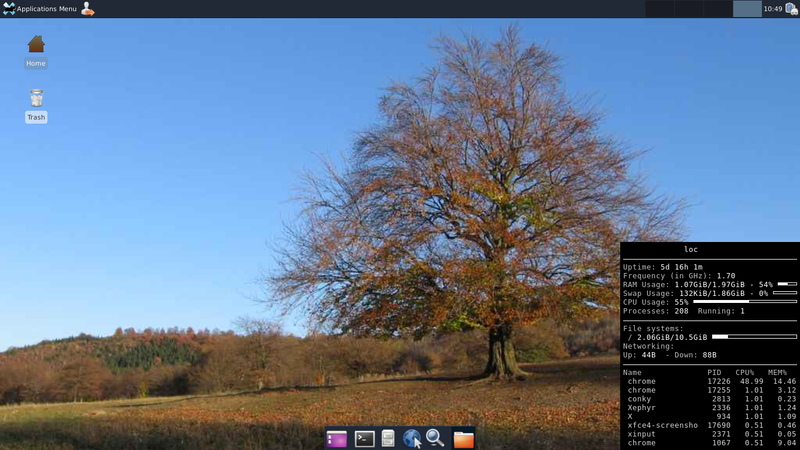 I have tweaked the config for Conky to my liking. Specifically I added more TOP lines at the bottom of the app. I will make a separate post about this a little later. For those who don’t know TOP is a command line utility for viewing things that are running on your machine. Learn how to use TOP here! Download my edited Conky config file here! Office download it here, it is great. Libre Office opens in less than 3 seconds. I dare you to try and get Microsoft Word to open that fast! Ha! We browsing on linux is also very fast. I don’t know why but sometimes websites load faster on the linux side as well. Strange?? Keep Checking back for more to come! This entry was posted in Chromebook, Chromebook and Linux and tagged chromebook, Conky, Google Chrome OS, LibreOffice, linux, Microsoft Word, Operating system, Xfce by James Arnett. Bookmark the permalink.